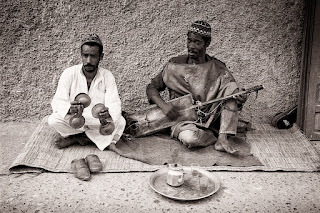 In July, a bulletin on the myspace page of a group of Moroccan musicians sent my mind wandering down some strange paths, got me thinking about music as a technology, as something people use to perform certain actions. Indeed, music is possibly one of the oldest technologies available to humans, a means of communication, a playful way of strengthening communities, and a form of transport to carry us out of ourselves. It's also currently used to terrorise, dehumanise and narcotise individuals and populations around the globe, in ways that allow us to draw tentative lines connecting spaces that seem to be in different worlds, the battlefields of Iraq and Afghanistan, the detention centres of Abu Ghraib, Guantanamo Bay or Diego Garcia, and the shining consumer wonderlands of the modern shopping mall or office space; spaces of chaos, control and of a particular, possibly perverse idea of freedom. We'll start our wanders around this strange territory in a place where the magical possibilities of sound are acknowledged and celebrated, a place where we might hear echoes of a future music of radical potential, a sonic weapon to counteract the narcotic spell cast over us, a musick yet to be, for as Plato said Musical innovation is full of danger to the State. The village of Joujouka sits in the red hills of the Rif in Northern Morocco. It is a place somewhat removed from the modern world. There is no electricity, no running water, no pavements or roads, the village being accessible only on foot. Everything that's needed here must be carried by mules or the villagers themselves. While the Rif Mountains are known as a lawless and wild place in which some of the world's finest hashish is produced, Joujouka itself is known for only one thing. Its music. The Master Musicians of Joujouka play a strange, hybrid trance music that draws influences and inspiration from the various peoples who have colonised or settled Morocco over the years, but which has its roots in the pre-Islamic religious ceremonies of the Berber people. The music of Joujouka has been passed down through generations, father to son, a string of pearls stretching back further than any recorded history. The maleems are exempt from farming and other types of manual labour, their sole responsibility is to provide the world with sound, and it is a sound that vacillates between a beatific serenity and a feral abandon as the men coax supple rhythms and circular melodies from their various hand drums, ancient guembris, flutes and rhaitas. This last instrument provides the Master Musicians with their signature sound, for these oboe like horns are played by groups who time the rhythms of their breathing to ensure the sound is endless, a hypnotic and infinitely complex wall of buzzing noise that colludes with the local hash to produce an awesome delirium. Despite its often noisy and frenetic nature, this is not the sound of a warrior people. The music is used in service of a spirituality, it magically opens channels of communication with the spirit world, it opens spaces of healing and protection and is performed in celebration of the glory of nature. It is concerned with the evocation and control of spiritual forces and is always used for a purpose and to obtain some definite result. Now of course, with the growth of a global market for 'world' music, the sound of Joujouka has spread. It is no longer reserved for the villager's rituals and ceremonies, or for the local festivals and parades. Recordings of the musicians are available to listeners all over the world as products of the culture industry, these recordings though can often be as difficult and jarring as those of Adorno's beloved Schoenberg and their arrival on the market is the result of a particular history and a particular set of counter-cultural connections. In the early '50s Paul Bowles, the proto beat writer, heard the sound while travelling in the Rif, he introduced the music to Brion Gysin who helped to popularise the group in the Interzone of post-war Tangiers. Gysin later turned on William Burroughs to the magical sound of the 4000 year old rock n roll band. As Morocco became a point on the 'hippy trail', news of the noise slowly spread. In 1968, Brian Jones arrived in the village where he recorded the annual festival of Bou Jeloud1. The following year, Timothy Leary sampled the villager's hospitality while enjoying a short break from prison2. In the '70s, the musicians recorded with Ornette Coleman and the Rolling Stones, their music peppered Burroughs' Breakthrough in the Grey Room, serving as a counterpoint to his tape splicing experiments. Since then they have travelled and played concerts around the globe, making money that has helped sustain the whole community, for even here people need money and the inhabitants of this remote and rocky region have little else to exchange. The press release posted on Joujouka's myspace page was written by a New York concert promoter and announced that the group were to cancel their summer tour of the US after encountering difficulties with their visa applications. A small thing, of interest to only a few people. Some members of the group have names that require extra scrutiny, suspicious names that are 'similar' to some known to the US Department of Justice. It's a small thing, the shadow cast by the War on Terror just falls in an unexpected place, making something that should be so simple frighteningly complex. The tightening of security that is occurring throughout the 'developed' world can often pass unnoticed, but beneath our noses walls and fences become ever higher, gates are locked more tightly and entry requirements become more difficult to meet. This bulletin reawakened me, forced me to think again about the reach of the current crusade. This is nothing short of total war, everybody is affected, no matter how remote our habitat, no matter how ancient our traditions or how peaceful our intentions. I began to dream of musical reprisals, channeling my own anger and indignation through the Master Musicians themselves, imagining their ferocious, kaleidoscopic drum and rhaita jams being used to bring down the walls, not of Jericho, but of those institutions that seeks to measure and judge us all, that try to order and control human life and which increasingly, (here I'm thinking of Agamben and bare life, of orange jump suits, cages and de Menezes) have the ability to decide who has the right to life and who counts as human. Of course, I am not the first to imagine the use of music as a weapon of war, indeed the military-industrial complex is already way ahead in that game. Music has long been a part of the sound of the battlefield, think of the Scots bagpipes or the trumpet blast of the cavalry and we can see that the military use of noise to frighten or disturb the opposition has a history. More recently, Coppola's cinematic image of helicopters flying low like dragonflies at sunrise, blasting Wagner from mounted speakers, is one of the most memorable in film history. Examination of the military use of music, of sonic warfare, ultimately slips away from what we normally think of as the theatre of war to expose some disturbing aspects of modern culture and reveal the possibility that the civilian populations of the developed world might regularly be subjected to techniques of psychological warfare. Some knowledge of the American army's use of music in combat situations started to filter into the popular imagination in 1989, specifically during the US invasion of Panama, part of George Bush Sr.'s War on Drugs. The target of the invasion was Manuel Noriega, dictator of Panama, associate of the notorious cocaine baron Pablo Escobar and the Medellin Cartel, and long time ally of the CIA and US government in their clandestine operations against various Central and South American left wing guerilla groups3. During the invasion, 27,000 American troops landed in the country with the intention of deposing Noriega. The dictator went to ground in Panama's Vatican Embassy. US forces surrounded the building, but were unable to physically attack for fear of ruining relations with the Vatican. Instead, troops bombarded the embassy with constant loud heavy rock music in an effort to drive Noriega out. This effort lasted days before complaints from the Vatican forced the general in charge of the operation to pull the plug on the music4. Noriega's subsequent surrender had little to do with the military's sonic experiment, but this did not deter them from again attempting to use high volume rock 'n' roll as a 'non-lethal weapon'. In 1993, the sound systems came out again for the siege of Mount Carmel in Waco, Texas. This operation, led by the FBI, targeted David Koresh and other followers of the Branch Davidian sect. The siege lasted 51 days and for parts of this time the Branch Davidians were treated to marathon sessions of loud music in order to disturb their sleeping patterns and break morale inside the camp. The music was just one element of the FBI's psychological operations to break the siege, operations that again proved unsuccessful as tensions escalated on both sides. As the siege wore on, the event turned into a global media circus that ended with the deaths of many Branch Davidians as Mount Carmel went up in televised flames5. Music has also been used as a weapon during the conflicts in Afghanistan and Iraq. Before the brutal military attack on Fallujah in 2004, US troops engaged in psychological operations in an attempt to weaken resistance. These operations lasted for three weeks before the tanks and troops rolled into the desert city, and again involved the use of high powered speakers mounted on tanks and humvees. The army played AC/DC, Metallica, Led Zeppelin, Eminem and Barney the Purple Dinosaur at high volume for long stretches of time to disorientate and confuse the enemy, in the hope of flushing out insurgents or weakening their ability to fight6. That the attack on Fallujah resulted in so many casualties on both sides, with much heavier resistance to allied troops than was anticipated, perhaps points to the failure of such psychological tactics on the battlefield. Music has however, been used elsewhere in the War on Terror, and perhaps more fruitfully, for it has become common practice to subject 'enemy combatants' to loud music in detention centres and interrogation rooms in efforts to gain information about insurgent activity or terrorist organisation. In April 2004, photographs from the Abu Ghraib detention centre hit the news. These disquieting images depicted naked and contorted Iraqi prisoners suffering humiliation at the hands of grinning US soldiers. The world let out a collective gasp of disgust when presented with such horrifying evidence of the dark face of modern warfare. Donald Rumsfeld blew gas about 'bad apples' and placed the responsibility with a handful of low ranking soldiers, rubbishing the idea that this could be part of any kind of policy, but by the time further evidence started to emerge the visceral impact of the original story had lost momentum. Since the Abu Ghraib pictures, it has become apparent that the techniques depicted in the photographs are being used in a number of detention centres and prisons associated with the War on Terror, including at Guantanamo Bay itself. These techniques include the use of stress positions, sleep deprivation, and alternating sensory deprivation and sensory overload. Considered as a constellation of practices, these techniques have been called 'no-touch torture', or torture-lite. This phrase makes it all sound like the low fat, vanilla version of what should presumably be thought of as heavy torture, which I suppose would include the use of pliers, thumb screws and electric shocks. Torture lite in contrast involves none of this medieval stuff, for its aim is not to physically degrade its subject, but to psychologically attack the victim's sense of self, to erode his or her subjectivity. The term conceals the reality of these devastating practices, for it is only when we hear first hand reports of torture-lite that we can begin to estimate the distance between actual practice and official rhetoric. In 2003, a BBC report suggested that Iraqi enemy combatants were being locked in shipping containers in the desert heat, and subjected to songs such as Metallica's “Enter Sandman”, or Barney the Dinosaur's “I Love You” at high volume for extended periods7. Since then, first hand accounts collected by Human Rights Watch have described many other instances in detention centres and prisons across the region. Benyan Mohammed, a prisoner at Guantanamo, told human rights lawyers that high volume rap music was pumped into his cell for twenty solid days before it was replaced by twisted laughter and “Halloween sounds”8. If we try to imagine ourselves subjected to such treatment, and then think of how the music is often played while we are kept in complete darkness, or in rooms with strobe lighting in which the temperature fluctuates between extreme heat and extreme cold, then we can begin to come to a vague understanding of how such treatment may push a person to the brink of insanity. The fact that such similar practices are being revealed in detention camps in Iraq, Afghanistan and Guantanamo Bay destabilises Rumsfeld's insistence that the practices depicted in the Abu Ghraib photographs were the work of a few corrupt soldiers. Indeed, Alfred McCoy argues in his book A Question of Torture: CIA Interrogation, from the Cold War to the War on Terror (2006)9 that these practices are the result of five or six decades worth of research conducted by the CIA and British and Canadian secret services. According to McCoy, the techniques of no-touch torture originate in the experiments conducted during the Cold War in programs such as MKUltra, the CIA's notorious mind control program that saw thousands of American soldiers and civilians used as guinea pigs in the search for truth drugs and mind control techniques10. In John Marks' 1979 book The Search for the Manchurian Candidate, we find descriptions of early experiments with some of the techniques in current use including ultrasonics, solitary confinement, sleep deprivation, fluctuating temperatures and strobe lighting, while other experiments involved all kinds of drugs, electroshock treatments, even neurosurgery. These programs all carried out by secretive state sanctioned institutions acting in contravention of international laws and treaties, have led to the modern system of torture lite that was tested in counter insurgency operations during the Vietnam War, and again by British secret services during its campaign against the IRA in the '70s and '80s, and by police units across South and Central America11. It may be comforting to imagine that such techniques are reserved for remote detention centres and interrogation cells, but music is also used to manipulate behaviour in more subtle and insidious ways that we may recognise from our own everyday experiences. The use of music to manipulate workers and consumers for commercial ends has a long history that perhaps provided some inspiration to those CIA operatives who first decided to use sound as part of their repertoire of interrogation techniques. The Muzak Corporation was born in 1934, the brainchild of Major General George O. Squier. Over the course of the century, the Muzak Corporation came to define the piped music industry, tirelessly promoting their product until now, in the 21st Century world of consumer capitalism, this music is almost ubiquitous in public space. Squier recognised music's link to the emotions and looked for ways to capitalise. He developed systems to deliver music through telephone cable and proceeded to sell this piped music to businesses. While the styles of music available through the Muzak Corporation and other similar companies has changed radically over the years, the purpose of this music has however, always remained the same; to manipulate human behaviour. Muzak's Stimulus Progression(R) system was designed to “...boost productivity, reduce errors and improve morale in businesses throughout the country”12. The system uses songs programmed in fifteen minute blocks, imprinting a kind of counterfeit bio-rhythm to provide workers or shoppers with a subconscious sense of 'forward movement'. The corporation claim their product helps to reduce the stress of shoppers and workers, leading to increased brand perception, loyalty, sales and productivity. If we “...employ the science of Muzak: in an office, workers tend to get more done, more efficiently, and feel happier. In an industrial plant, people feel better and, with less fatigue and tension, their jobs seem less monotonous. In a store, people seem to shop in a more relaxed and leisurely manner. In a bank, customers are generally more calm, tellers and other personnel are more efficient. In general, people feel better about where they are; whether it's during work or leisure time”13. Such statements made in Muzak's corporate literature place the company's invisible product squarely in the realms of the behavioural sciences. Although the effects of piped music are seldom considered, there have been a growing number of complaints in recent years that help us to make the connection between muzak and Abu Ghraib. The negative psychological effects of muzak become most acute during the consumer frenzy of Christmas, when shop workers and harassed consumers, bullied from all sides into spending beyond their means or needs, are subjected to an endless stream of inane Christmas songs. Some have likened this bombardment to a kind of psychological torture. 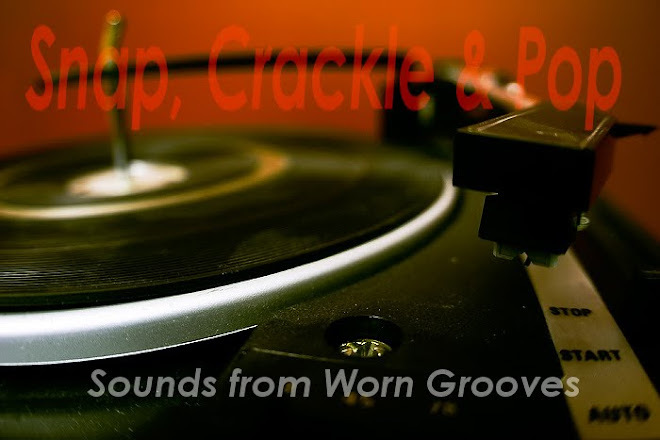 A spokesman for Pipedown, the anti-muzak pressure group said Christmas muzak is “...acoustic torture ...it's not loud but the repetitive nature causes psychological stress”14. Meanwhile, an Austrian shopworker's union has tried to limit the amount of time shops are allowed to play festive music each day, claiming it is a health and safety issue. A union representative told reporters that “...shop workers can't escape the Christmas muzak. They feel as if they are terrorised all day. Especially Jingle Bells. It arouses aggressive feelings”15. And so, the soundtrack to so much of our experience of public space is revealed as a scientifically engineered instrument to pacify a potentially unruly workforce and to narcotise the consumer. Music's abilities to connect with the emotions and to alter our psychological state are being exploited and perverted in a number of ways in a variety of locations, from office or commercial spaces to clandestine interrogation cells. What we generally consider to be a harmless form of creative expression becomes a tool, coldly employed in the manipulation and control of populations, numb from the constant stimulus of programmed information. I again imagine the musicians of Joujouka, dressed in dusty djellabas, pounding hand drums, fire music from broken saxophones. They are joined by drummers from Burundi and Kerala, Tibetan monks from remote mountaintops blow trumpets carved from the thighbones of dead saints, bleary eyed kids with whistles and pans, punks with electric guitars modified for maximum feedback. Sound systems mounted on trucks blast non repetitive beats unleashing crazed movement, fearsome wardancing. All are collaborators in a spontaneous sonic uprising that intends to awaken us from our collective dream. The streets fill with people, we congregate in the centres of power, in prisons and military installations, banks and marketplaces, we reclaim public space and fill it with an unpredictable and invigorating noise, a musick that embodies the creative power of humanity, harnessed and concentrated to banish the evil spirits that haunt the modern world. Jones released sections of these recordings as the infamous album Brian Jones Presents The Pipes of Pan at Joujouka. (1971) Rolling Stones Records. Leary describes his stay in the village in a chapter entitled “The Four Thousand Year Old Rock 'n' Roll Band: A Memory Experienced” in Leary, T. (1970) Jail Notes London: New English Library. If this sounds like an unlikely alliance, check out White-Out: The CIA, Drugs & the Press, Cockburn, A. & St. Clair, J. (1998) London: Verso, for a comprehensive analysis of the CIA's involvement in the global drugs trade. It's been a long time since there's been any activity over here at Snap, Crackle and Pop, but I thought it might be a good moment to start consolidating the archive here to make things a little easier for people to find what they're looking for. With that in mind, here are all the cassettes and CD's of Gnawa or Gnaoua music we posted over the years in chronological order. Comments are always appreciated, I love to hear your views on life and music. Hello good people. You'll be excited to hear that the first episode of The Junk Shop is streaming now at totallyradio.com. Check it out! And many thanks for all of your support over the years, I hope you've enjoyed the music as much as I have. You might want to put it on your walkman, in which case you can download it HERE. I think this may be the highlight of this year's finds, some supremely funky rumba from the Congo. The influence of James Brown is clear and the addition of a keyboard sets Sosoliso's sound apart from many of the other rumba groups. Check it out and I'm sure you won't be disappointed. The dusty sound of old records, other people's detritus picked up from boot sales, flea markets and charity shops. Forgotten music for our enjoyment. The music is, of course, for evaluation purposes only. If you like what you hear then go out and try and buy stuff...or something, give money to a down on his luck musician, or sponsor a good busker, it may be the start of something beautiful. If any of the zips die, then post a comment and i'll try to repost. And leave comments, abuse, name calling, any response is welcome. I think all of the albums posted are currently unavailable, but if this is not the case we'll remove the offending files.